Wow! There are few announcements these days that really are big news but FFG have just managed one by announcing they’re going to be releasing their own Star Wars games. 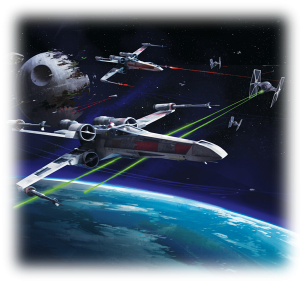 FFG have been going from strength-to-strength as a company as they secured bigger and bigger licenses – much in the same way that Electronic Arts did the same with videogames back when they were young. I have a few issues with FFG in terms of the costs of their expansions (as they release so many) but they do release solid, quality games and have created a couple of my favourite non-Euro games. For me, this is great news. As a major Star Wars fan, I’ve been wondering for years why no-one’s done any serious games. Even to the point last year that a friend and I discussed creating a Star Wars large battle game with a demo set using the toys to potentially get Hasbro’s attention. In my opinion, the last great Star Wars game was Assault on Hoth by West End Games (a lot of randomness and very cheap production but a game we still play to this day) and since then Hasbro continually released weak board games that primarily served kids. FFG have announced two games X-Wing (http://bdg.ms/afdi) – a 2-player, space combat, dogfighting game – and Star Wars: The Card Game (http://bdg.ms/afdj) – a 1-4 player co-op card game. I’m definitely more interested in the first one as I find living card games a bit daunting due to the continual churn of new cards; however, I’m sure I’ll try the basic set at least.. So, congratulations FFG. I look forwards to some great Star Wars gaming to come – just keep it in the original trilogy era please (which looks to be the case so far). As Vader would say: Impressive.